Photo courtesy of LWI Online. Three Wake Forest Law professors and a staff member will make presentations at the 17th Biennial Conference of the Legal Writing Institute entitled, “Thriving in a Time of Change,” on July 10–13, 2016, in Portland, Oregon. 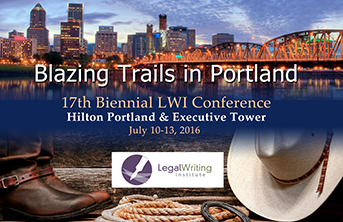 The 2016 Biennial Conference of the Legal Writing Institute will bring together legal writing professors and other members of the legal academy and practicing bar. The conference this year has a renewed goal of building our sense of community. In LWI’s always collegial and collaborative environment, colleagues will have a chance to meet, reconnect and share ideas about pedagogy, scholarship and professional growth. In this session, learn how to play to win the book proposal game and hear about tips and strategies on crafting a submission to get the deal. Participants will receive a template for preparing a book proposal and a bibliography of helpful resources. In addition, they will receive insight into the advisory board/peer review process and the role of the acquisition team, including first-hand accounts of working with publishers and editors. Large-group session that will focus on purpose and pedagogy of critiquing. In this opening session of the Critiquing Workshop, participants will receive advice about providing effective written feedback on student work. How Multiple Institutional Voices Contribute to Greater Professional Growth in Our Students and Ourselves – As we shape them into practice-ready thinkers and communicators, legal writing faculty see students struggle daily with issues related to confidence, identity, and professionalism. Because no one constituency can effectively provide students with the full range of skills they need to become balanced, expert practitioners, careful collaboration between LRW and doctrinal faculty, deans, career center staff, and other administrators is the key to students’ success. In this presentation, a panel comprised of LRW faculty, a dean of students, and a director of professional development who works with career counselors will discuss strategies that have worked at three different law schools to help develop the professionalism of this new generation of law students. We’ll discuss the Inns of Court program at GW Law, which offers students support and guidance from a diverse set of advisors dedicated to enriching their law school experience, enhancing their career opportunities, and providing cutting-edge programming on professionalism and non-cognitive skills development. We’ll also discuss opportunities for collaboration between law schools, and will discuss Northwestern Law’s growth mindset workshop with exercises focused on students’ loss of confidence in response to feedback, as well as innovative approaches to professionalism training at Wake Forest School of Law. This session will give attendees practical tips they can use to increase media interest in their work. It will emphasize the importance of social listening, and how the right balance of push-pull strategies can result in high-profile media mentions.